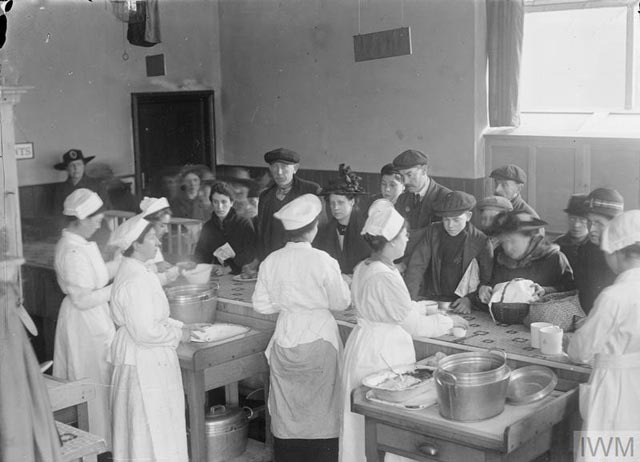 A Ministry of Food was established in December 1916 to combat food shortages and price inflation, results of the ‘submarine menace’. Hornsey’s MP, Kennedy Jones, was appointed director-general of the Food Economy section. What was Hornsey’s response? Hornsey Council set up its Food Control Committee in spring 1917 to monitor supplies, encourage locals to grow vegetables on allotments and to widen their diet with food such as rabbit which was plentiful. By spring 1918 meats, fats and sugars were rationed and families were allocated to a particular grocer and butcher to ensure equal distribution. This further affected standards of nutrition hitting poorer families particularly hard. National Kitchens, providing affordable and nutritious meals on a mass scale, were promoted by the Government. Hornsey’s Food Control Committee, chaired by Alderman C W West, considered setting up local National Kitchens as early as January 1918 when it was felt that the matter would involve a lot of detailed work and many questions had to be answered. Who would pay for them, the Government or the Council? Where should the kitchens be set up? What suitable properties were there to rent? Who would cook and serve the food? What sort of meal should be provided and how much should it cost? A Ministry of Health official visited the borough in March urging the Council to act but councillors were still unsure. It was not until July 1918 that three locations were seriously considered – Topsfield Parade Crouch End, Hornsey High Street and the Brotherhood Hall on the Campsbourne Estate, Hornsey’s main area of social and economic deprivation. Each was to have a superintendent costing £150 per annum, sufficient cooks at 30 shillings a week and kitchen helpers at 20 shillings a week. Voluntary helpers were to be recruited to serve the food. In September the Food Control Committee abandoned the High Street location claiming that the rents were too high to make it a feasible project. Interestingly, the Crouch End facility was to be called a National Restaurant whilst that in Campsbourne was to be a National Kitchen. A letter to the editor of the Hornsey Journal which appeared in the 27th September 1918 edition sums up the frustration felt by Hornsey’s residents at the Committee’s prevarication. Dear Sir. – I am sure I am voicing the opinion of thousands of worried and overworked wives and mothers of Hornsey and Crouch End at the delay in opening our long-promised national restaurant and kitchen. Surely if Wimbledon can have six, Hornsey is sufficiently important to have at least two, in addition to other parts of the borough, where no doubt they would be welcomed. We are told to save coal and gas, and what better way of doing it than that, where we could all go at midday and eat our meals: also our husbands, daughters, sons – unless killed as mine are – in the evening, and all together on Sundays. What a boon to save shopping, cooking, washing up, and endless worry, as private people cannot get the variety. It wants a few councillors to hustle a bit and get the necessary equipment. We are behind the times here. I am sir your obedient servant. DISAPPOINTED MOTHER. At last, on 6th December, Kennedy Jones MP opened the National Restaurant at Nos. 17-18 Topsfield Parade Crouch End. By then celebrations following the Armistice on 11th November and the increasing population hit by the Spanish Flu pandemic had deflected interest from the scheme. The national kitchen in Campsbourne finally opened on 1st February 1919. There were no local dignitaries or officials present. Yet in late March the Hornsey Journal reported that the two kitchens were near ‘the end of their career’. The Campsbourne kitchen closed on 3rd May 1919 and the Crouch End one followed on 26th July. An ignominious end in Hornsey to a national scheme which ensured nutritious meals for hundreds of thousands of Britons and was a lifeline to the poor in Hornsey as elsewhere in the country, but which never received sufficient support and decisive action from Hornsey officials. Female cooks serving the public at a National Kitchen. Copyright: © IWM.